Discussion in 'Alternative Treatments and Research' started by calin, Mar 20, 2012. I am finding more and more resources that indicate that heavy metal poisoning can cause tinnitus. Of course, this may not be the cause of your tinnitus, but ya never know! So, I am now doing therapy for that possibility. Tooth fillings, fish, smoking, vaccinations, etc. can all contribute to this poisoning. Here are some links for you to do your own research. Nervous System: Irritability, low concentration, memory loss, insomnia, depression, anxiety, tingling of the extremities, tremors, disturbed sense of smell and taste (metallic taste), unexplained burning sensation or numbness, pain, headaches, fatigue, tinnitus. Immune System: Chronic or frequent viral, bacterial or fungal (Candida) infections, autoimmune disorders, allergies. The EPA has determined that methyl-mercury is a possible human carcinogen. Cardiovascular: Abnormal heart rhythm, high blood pressure, cardiomyopathy. Endocrine System: Hypothyroidism, hypoglycemia, adrenal disease, infertility. Gastrointestinal: Food sensitivities, bacterial or fungal overgrowth, recurrent parasitic infections, abdominal cramps, irritable bowl symptoms. Systemic: Premature aging, fatigue, fibromyalgia. When you chew gum, drink hot liquids or after you eat the Mercury levels measured in a person's mouth are frightening. I would highly recommend people get them removed but it's important to get yourself detoxed as well otherwise you can actually make things worse. Here is a list of Dentists who specialise in Mercury removal. Don't just go to any dentist to remove them if they haven't been trained in the proper protocols. Unfortunetly removing these poisionous fillings does not cure Tinnitus unfortunetly. The best example I have heard is that of a River bursting it's banks and flooding the local area causing severe damage to your Car. Well you can remove the water and seal the river but your car will still be broken. Getting rid of the cause will not remove the damage but it will substantially improve your long term health. My theory for me is that the Mercury weakened my Immune system so much that it couldn't cope with keeping the germs and bacteria on my inner war under control. So they flourished and that is how I got my ear infection which is how I got my Tinnitus. I eventually got rid of the ear Infection but the Tinnitus remained. Got rid and detoxed from my Mercury fillings last year. My advice is to avoid heavy metal posioning at all costs and to regularly detox at least once a year to get rid of anything harmfull your body might have. Oh yeah and never get Mercury fillings!! Thank Molan. What do you suggest for detox? Hi Calin, well first thing is first clearly the fillings must be removed otherwise any detox will only be tempory until the body is flooded with more mercury from them. The best home way to detox Mercury that I'm aware of is mega-dose Chlorella. However the number 1 way I have found for detoxing Mercury is Intravenous Vitamin C and Gluthothione. The science of it strongly suggests it is the quickist, safest and most effective way of removing toxic metals from the body. Trouble is not all Biological dentists offer this although some will definetly accomodate you if you request it. For more information I would recommend contacting the pioneers of this detox treatment they have called 'V-tox therapy'. Also you can buy their book 'Toxic Dentistry exposed' from their site. That book was a real eye opener for me. They should be able to provide advice if you wanted to do this detox at another Biological dentist. If you have anymore questions feel free to ask. I already take chorella - it is in my super greens powder that I take twice a day for my PH balance ...and just because. I am trusting the UST heavy toxins treatment... and since you say it will never go away due to the filings, I will just listen to this protocol regularly then and continue my super greens drink mix! I think it would be interesting to study how many tinnitus sufferers with silver fillings have developed it. Your average local Dentist can make things much worse for patients if he/she does not used proper Mercury removal procedures. Many have not been given the proper training. 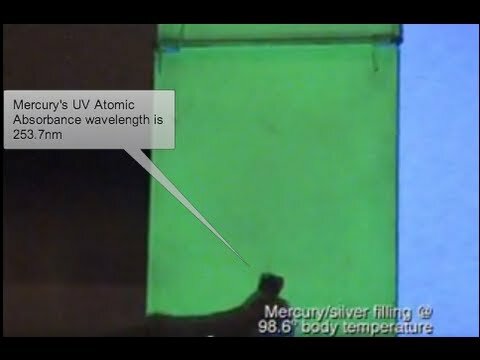 What are the proper mercury removal procedures? I've just had dental work done, and two mercury fillings removed. I'd like to know what those procedures are, so I can suggest it next time. Hi Karen, please see the article below from the International Academy of Oral Medicine and Toxicology. It details what should be done for safe Mercury removal from patients. Yikes! I didn't know about all this! Thanks, Molan, you've done us all a great service today. I have only 1 more mercury filling left, and I'll talk to the dentist before it is removed. I just finished this book. If you are interested in mercury, I recommend it. Dr. Jane M. Hightower M.D. No problem Karen I'm happy to help! I have to say though if your Dentist dosen't have the appropriate equipment and isn't trained to perform safe Mercury removal I would strongly recommend going to a Dentist who is. Whatever happens I strongly advise you to make 100% sure they are following the Mercury removal protocols as outlined by the International Academy of Oral Medicine and Toxicology. Thanks for the information, Jim, Molan, and Calin! I'm glad you brought this to everyone's attention. Scary stuff! Looks like a lot of us could use some heavy metals detox. Any members ever have chelation therapy? Did it make a difference in your tinnitus? I have just google heavy metal poisoning and tinnitus and this thread came up. I am even more convinced than ever that my tinnitus is caused by all the titanium implants I have in my mouth. I also had Mercury fillings as a child too. I definitely want to detox but am not sure how to go about it. I am finding the who idea of metal toxicity terrifying. @Evian ...Only after being properly tested would you have sufficient information in order to be able to make an informed decision as to whether you should detox or not. In my case, I did. I went through chelation therapy back in the late 90's because of the high levels of mercury and aluminum in my system. It worked very well for me as far as reducing those levels. However, it had no effect on my T; nor did I expect that it would. That said, I first needed to be tested in order to identify which toxic metals were above a safe level. For that, I obtained a test kit that only required me to provide a hair sample. After a couple of weeks, I received a very detailed report with the results. Once I had that info, I had to locate a place that performed chelation therapy. It took about four months of chelation therapy (once a week) to get the levels down to safe level. Yes, I had it for toxic metals that were above a safe level. It had no effect on my T.
I guess whatever has caused mind the damage is done anyway. I wanted to bring this post to the top again because I believe there is a lot of detox we can do to help some Tinnitus sufferers. I know there are many different reasons people have T, and I can't tell you for sure why I have it even, but I just try some things I find by reading posts/articles. I have read quite a bit on the heavy metal detoxing, and right now, am doing some baking soda to help with that. I do have one filling that is silver(mercury?) but when I was at the dentist a couple of months ago, I didn't know about the heavy metal stuff, so didn't ask him about it. I don't know that my insurance will cover removal, if it is mercury, but I'll find out. In the meantime, I can try a few things on my own. The baking soda, who knows, but I figure it won't hurt to try it. I also take B50 (complex) magnesium, and trying to figure out the alkalization thing. what are you talking about? that's a debunked conspiracy theory. for instance, people claim that the MMR vaccine from MERCK causes autism/brain damage, which is totally wrong. "Nervous System Encephalitis; encephalopathy; measles inclusion body encephalitis (MIBE) (see CONTRAINDICATIONS); subacute sclerosing panencephalitis (SSPE); Guillain-Barré Syndrome (GBS); acute disseminated encephalomyelitis (ADEM); transverse myelitis; febrile convulsions; afebrile convulsions or seizures; ataxia; polyneuritis; polyneuropathy; ocular palsies; paresthesia." inflammation of the brain, caused by infection or an allergic reaction. a disease in which the functioning of the brain is affected by some agent or condition (such as viral infection or toxins in the blood). See NOTHING ABOUT TINNITUS, just brain swelling and brain function changes. How could brain function changes cause tinnitus? it's called chelation therapy. they give you an ionic compound that causes the heavy metals to bind to it and then those compounds can be metabolized. I am in favor of doing everything possible to improve tinnitus as long as it doesn't harm the person. But there is one thing I can't understand. If they (ENT, audiologist...) tell us that we have to take action as soon as possible or tinnitus becomes a brain thing, and that is all a problem of perception (habituation). What certain treatments would do? I've been told that everyone has the same tinnitus and that some give more attention than others.What would this tinnitus like? I never heard that, but I do read a lot about the different causes, and sounds folks hear. Heavy Breasts Causing Shoulder and Neck Problems — And in Turn Causing Hearing / Tinnitus Issues? Heavy Weight Lifting — An Unusual Treatment for My Tinnitus! Drivin Car in Heavy Rain/Storm — Decibels?